This entry is part 6 of 11 in the series Magento for PHP MVC Developers. Earlier posts include The Magento Config, Magento Controller Dispatch and Hello World, Layouts, Blocks and Templates, Magento Models and ORM Basics, and Magento Setup Resources. Later posts include Custom Magento System Configuration, In Depth Magento System Configuration, Varien Data Collections, Magento System Overrides and Upgradability, and Magento Default System Configuration Values. In our last article we told you there were two kinds of Models in Magento. Regular, or “simple” Models, and Entity Attribute Value (or EAV) Models. We also told you this was a bit of a fib. Here’s where we come clean. The following is part of a longer series about Magento aimed at developers familiar with PHP MVC development. While each article can be read stand alone, each article does build on concepts and code covered in previous articles. If you’re confused, be sure to catch up on the older stuff first. Also, later versions of Magento have introduced changes that require you to take a different approach to creating new tables. Zachary Schuessler did a bit of detective work and figured out the new science. Highly recommended reading. If you think about it, this makes sense. As the end-programmer-user of the system you want a set of methods you can use to talk to and manipulate your Models. You don’t care what the back-end storage looks like, you just want to get properties and invoke methods that trigger business rules. Every product has a name, every product has a price, etc. In an EAV Model, each “entity” (product) being modeled has a different set of attributes. EAV makes a lot of sense for a generic e-commerce solution. A store that sells laptops (which have a CPU speed, color, ram amount, etc) is going to have a different set of needs than a store that sells yarn (yarn has a color, but no CPU speed, etc.). Even within our hypothetical yarn store, some products will have length (balls of yarn), and others will have diameter (knitting needles). There aren’t many open source or commercial databases that use EAV by default. There are none that are available on a wide variety of web hosting platforms. Because of that, Varien engineers have built an EAV system out of PHP objects that use MySQL as a data-store. In other words, they’ve built an EAV database system on top of a traditional relational database. 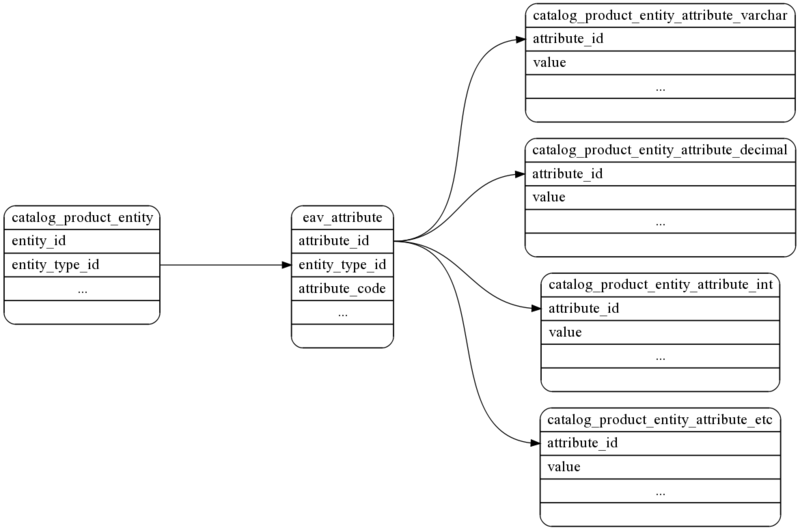 In practice this means any Model that uses an EAV resource has its attributes spread out over a number of MySQL tables. The above diagram is a rough layout of the database tables Magento consults when it looks up an EAV record for the catalog_product entity. Each individual product has a row in catalog_product_entity. All the available attributes in the entire system (not just for products) are stored in eav_attribute, and the actual attribute values are stored in tables with names like catalog_product_entity_attribute_varchar, catalog_product_entity_attribute_decimal, catalog_product_entity_attribute_etc. Beyond the mental flexibility an EAV system gives you, there’s also the practical benefit of avoiding ALTER TABLE statements. When you add a new attribute for your products, a new row is inserted into eav_attribute. In a traditional relational database/single-table system, you’d need to ALTER the actual database structure, which can be a time consuming/risky proposition for tables with large data-sets. The downside is there’s no one single simple SQL query you can use to get at all your product data. Several single SQL queries or one large join need to be made. That’s EAV in a nutshell. The rest of this articles is a run-through of what’s needed to create a new EAV Model in Magento. It’s the hairiest thing you’ll read about Magento and it’s something that 95% of people working with the system will never need to do. However, understanding what it takes to build an EAV Model Resource will help you undersatnd what’s going on with the EAV Resources that Magento uses. Because the EAV information is so dense, I’m going to assume you’ve studied up and are already very familiar with Magento’s MVC and grouped class name features. We’ll help you along the way, but training wheels are off. If you’re unsure how to do this, be sure you’ve mastered the concepts in the previous tutorials. Next, we’ll create a new Model named Weblogeav. Remember, it’s the Resource that’s considered EAV. We design and configure our Model the exact same way, so let’s configure a Model similar to one we created last time. You’ll notice the one different to setting up a regular Model is the <resourceModel/> name looks a bit more complex (weblog_resource_eav_mysql4). We’ll still need to let Magento know about this resource. Similar to basic Models, EAV Resources are configured in the same <model/> node with everything else. Again, so far this is setup similarly to our regular Model Resource. We provide a <class/> that configures a PHP class, as well as an <entities/> section that will let Magento know the base table for an individual Model we want to create. The <eavblogpost/> tag is the name of the specific Model we want to create, and its inner <table/> tag specifies the base table this Model will use (more on this later). We’re also going to need <resources/>. Again, this is identical to the setup of a regular Model. The resources are the classes that Magento will use to interact with the database back-end. Where Does That File Go? Until wide adoption of PHP 5.3 and namespaces, one of the trickier (and tedious) parts of Magento will remain remembering how <classname/>s relate to file paths, and then ensuring you create the correctly named directory structure and class files. After configuring any <classname/>s or URIs, I find it useful to attempt to instantiate an instance of the class it in a controller without fist creating the class files. This way PHP will throw an exception telling me it can’t find a file, along with the file location. Give the following a try in your Index Controller. we’d know our Model was misconfigured, as Magento was looking for the Model in code/core/Mage instead of code/local/Alanstormdotcom. Remember, the Model itself is resource independent. A regular Model and an EAV Model both extend from the same class. It’s the resource that makes them different. Clear your Magento cache, reload your page, and you should see a new warning. As expected, we need to create a class for our Model’s resource. Let’s do it! So, already we’re seeing a few differences between a simple Model Resource and an EAV Model Resource. First off, we’re extending the Mage_Eav_Model_Entity_Abstract class. While Mage_Eav_Model_Entity_Abstract uses the same _construct concept as a regular Model Resource, there’s no _init method. Instead, we need to handle the init ourselves. This means telling the resource what connection-resources it should use, and passing a unique identifier into the setType method of our object. Another difference in Mage_Eav_Model_Entity_Abstract is _construct is not an abstract method. It’s not clear if this is an oversight on the part of the Magento team, something to do with backward compatibility, or if there’s something deeper in the system preventing it. Regardless, it’s a useful fact to know when you go spelunking in the depths of the Magento system code. Every entity has a type. Types will, among other things, let the EAV system know which attributes a Model uses, and allow the system to link to tables that store the values for attributes. We’ll need to let Magento know that we’re adding a new entity type. Take a look in the MySQL table named eav_entity_type. This table contains a list of all the entity_types in the system. The unique identifier complexworld_eavblogpost corresponds to the entity_type_code column. This illustrates the single most important Magento concept, one that many people struggle to learn. Consider the computer in front of you. The OS (Mac OS X, Windows, Linux, etc.) is the software system. Your web browser (Firefox, Safari, IE, Opera) is the application. Magento is a system first, and an application second. You build e-commerce applications using the Magento system. What gets confusing is, there’s a lot of places in Magento where the system code is exposed in a really raw form to the application code. The EAV system configuration living in the same database as your store’s data is an example of this. If you’re going to get deep into Magento, you need to treat it like it’s an old Type 650 machine. That is to say, it’s the kind of thing you can’t effectively program applications in unless unless you have a deep understanding of the system itself. So, it’s theoretically possible to manually insert the rows you’ll need into the Magento database to get your Model working, but it’s not recommended. Fortunately, Magento provides a specialized Setup Resource that provides a number of helper method that will automatically create the needed records to get the system up and running. So, for starters, configure the Setup Resource like you would any other. Next, create its class file. Take note that we’re extending from Mage_Eav_Model_Entity_Setup rather than Mage_Core_Model_Resource_Setup. Finally, we’ll setup our installer script. If you’re not familiar with the naming conventions here, you’ll want to review the previous tutorial on Setup Resources. Clear your Magento Cache, reload you page, and the above exception should be thrown, meaning you’ve correctly configured your Setup Resource. NOTE: We’ll be building up our install script piece by piece. If you’ve read the previous tutorial, you’ll know you need to remove the setup’s row from the core_resource table and clear your cache to make an installer script re-run. For the remainder of this tutorial, please remember that anytime we add or remove an item from our installer and re-run it, you’ll need to remove this row from the database and clear your Magento cache. Normally you would create this file and run it once, a tutorial is something of an edge case. We’re calling the addEntityType method on our installer object. This method allows us to pass in the entity type (complexworld_eavblogpost) along with a list of parameters to set its default values. If you’ve run this script, you’ll notice new rows in the eav_attribute_group, eav_attribute_set, and eav_entity_type tables. So, with that in place, if we reload our complexworld page, we’ll get a new error. So, we’ve told Magento about our new entity type. Next, we need to add the mysql tables that will be used to store all the entity values, as well as configure the system so it knows about these tables. If you’ve spent any amount of time looking at the stock Magento installer files, you’ve seen a lot of manual SQL being used to create tables for EAV Models. Fortunately for us, this is no longer necessary. Our Setup Resource has a method named createEntityTables which will automatically setup the tables we need, as well as add some configuration rows to the system. Let’s add the following line to our setuup resource. The createEntityTables method accepts two parameters. The first is the base table name, the second is a list of options. We’re using the Setup Resource’s getTable method to pull the table name from our config. If you’ve been following along, you know this should resolve to the string eavblog_posts. We’ve omitted the second parameter which is an array of options you’ll only need to used it for advanced situations that are beyond the scope of this tutorial. So, let’s go back to our page and reload. Success! You should see no errors or warnings, and and a dumped Alanstormdotcom_Complexworld_Model_Eavblogpost — with no data. The last step we need to take in our Setup Resource is telling Magento what attributes we want our Model to have. This would be equivalent to adding new columns in a single database table setup. Again, the Setup Resource will help us. The two methods we’re interested in are installEntities and getDefaultEntites. The naming here can be a little confusing. After all, we just ran some code that told Magento about our entities, but now we need to do it again? The code from the previous section was simply telling Magento about a type of entity that we may add to the system. These next bits of code are what will actually add a single entity of your type to the system. If you wanted to, I’m pretty sure you could create multiple entities of the same type. You can also get tattoos on the inside of your eyelids. If you’re not sure if either is for you, they’re not. So, let’s add the following method to our Setup Resource. And then add the following call to the end of our setup script. Reload your page and you should see the die/exit message specified above. If that’s the case, it’s because you’re re-running your setup script and calling the createEntityTables method again. Magento generates SQL statements for the DROPing and CREATEing your tables. Unfortunately, it doesn’t take into account the FORIGN KEY relationships, and tries to DROP/CREATE the primary entity table first. For the purposes of this tutorial, just comment out the line(s) calling createEntityTables. Again, this installer would normally run once and createEntityTables would only be called once. When you call installEntites, Magento will need to do several things to install your entities. Before it can do this, it needs to know what your entities are. The contract here is for you to have getDefaultEntities return the entities. (It’s also possible to pass installEntities a list of entities to install, but I’m trying to stick to the Magento core conventions). Side Node: Strangely, Magento entities are configured using a simple nested array structure. It seems an odd choice in a system that’s been described by some as OO’d to death. To start with, we’ll add our Eavblogpost entity and give it a single attribute named title. Alight, that’s a pile of code. Let’s break it apart. The getDefaultEntities method should return a php array of key/value pairs. Each key should be the name of the entity type (setup with $installer->addEntityType('complexworld_eavblogpost',..., each value should be an array that describes the entity. These should match the values you used in the call to $installer->addEntityType(.... The final key, attributes, should contain yet another array that describes the attributes themselves. This next array is, yet again, an array of key value pairs. This time the key is the attribute name (title) and the values are a final array of key value pairs that define the attribute. For the sake of simplicity we’ve chose to define a single attribute, but you could go on to define as many as you’d like. Finally, we have a long list of attribute properties. Unfortunately, this is where your author has to ‘fess up and tell you he’s unsure what most of these do. Many involve driving features of the Magento back-end UI, such as label and input. Varian engineers have chosen to tightly bind their UI implementation with their back-end Model structure. This allows them certain advantages, but it means there are large parts of the system that remain opaque to outsiders, particularly web developers who’ve been chanting to mantra of back-end/front-end separation for near on a decade. While these do not refer to the MySQL column types, (but instead the EAV attribute types), their names (varchar, datetime, etc.) are indicative of the values they’ll hold. This is clearly the lamest.blogmodel.ever, but lets try adding some rows and iterating through a collection and get the heck out of here before our heads explode. Add the following two actions to your Index Controller. If you take a look at your database, you should see 10 new rows in the eavblog_posts table. as well as 10 new rows in the eavblog_posts_varchar table. Notice that eavblog_posts_varchar is indexed to eavblog_posts by entity_id. This is just a standard Magento _construct method to initialize the Model. With this in place, reload the page, and we’ll see all the titles outputted. Those of you with sharp eyes may have noticed something slightly different about the collection loading. EAV Attributes: Attributes aren’t limited to datetime, decimal, int, text and varchar. You can create your own class files to model different attributes. This is what the blank attribute_model is for. Collection Filtering: Filtering on EAV collections can get tricky, especially when you’re dealing with the above mentioned non-simple attributes. You need to use the addAttributeToFilter method on your collection before loading. EAV Models are, without a doubt, the most complicated part of the Magento system that an ecommerce web developer will need to deal with. Remember to take deep breaths and that, at the end of the day, its just programming. Everything happens for a concrete reason, you just need to figure out why.